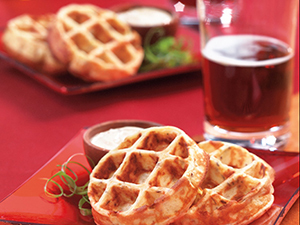 These savory waffles can span the dayparts, serving as a unique breakfast or brunch item, innovative snack or appetizer, or even as the base for fried chicken for that current favorite, chicken and waffles. To save a step and help control waste, the recipe can use boiled or mashed potatoes left over from meal service. 1. Boil potatoes in water until done; drain and peel. Press potatoes through a ricer. 2. With electric beater, mix riced potatoes with eggs, flour, Parmesan and caraway seeds until a thick dough forms. Add club soda, a little at a time, blending until you have a slightly runny batter, like a thick pancake batter. 3. Preheat waffle iron and rub with fat-side of bacon rind. Add batter to hot waffle iron and bake to a golden brown. After each waffle is baked, rub waffle iron with bacon rind before making another. 4. Serve waffle immediately or keep warm to maintain crispness.